From "Where can I find our healthcare docs?" to "Can we order pizza rolls for the kitchen?" These are now questions for Spoke! 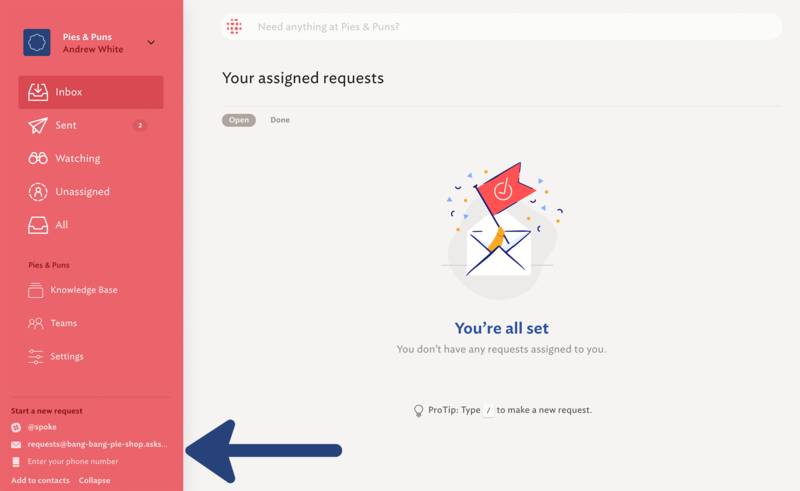 This guide will introduce you to the Spoke web interface, and help you get acquainted with making requests. 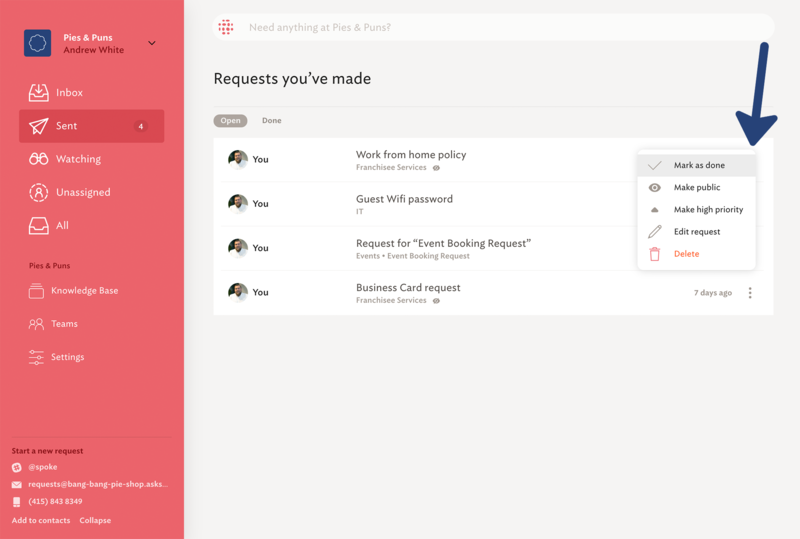 Log into the Spoke web app; you'll notice the bar at the top allows you to create requests from the web. 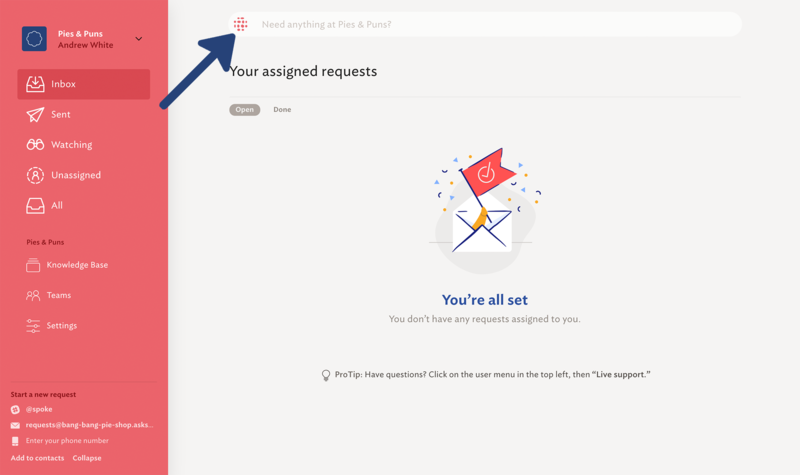 In the lower left corner of every Spoke account, you will find the e-mail, Slack, and SMS number that you can use to create requests. While Spoke has many channels that can be used to Ask Spoke, some actions can only be completed in the Spoke web interface. Sent - these are all the requests you have sent out. If you want to keep track of the things you need, come here to see the updates. Watching - this folder shows you everything your team is working on, even if it’s not assigned to you! Unassigned - This folder helps to make sure NOTHING falls through the cracks. All - Use this folder to check out what everyone is asking in "all." Use this folder to filter through all requests by resolution status, and team. It’s a great way to get an idea of what’s going on amongst the different teams. Edit the request title by selecting "Edit request"
If the request contains private details, select "Make private" to hide it from other users not on the assigned team. More information about private requests can be found here. Delete the request, if you’ve changed your mind, or mark it as resolved. 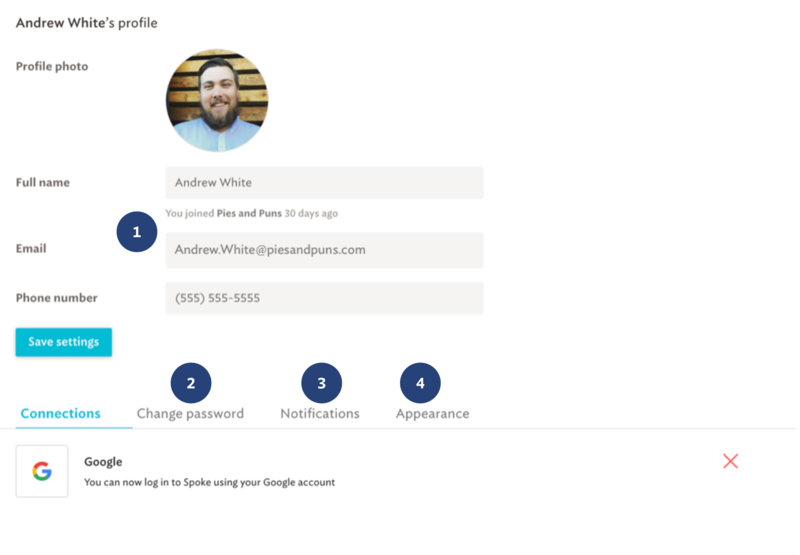 If you need to edit your Spoke profile, it can be accessed at any time by selecting the down arrow next to your company name in the top left of the screen, and selecting ‘my profile’ from the dropdown. 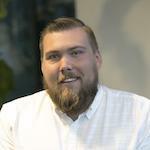 Here: you can introduce yourself to Spoke! For security purposes, Spoke only replies to SMS or email requests from users that have filled this out; make sure to introduce yourself, and fill out your profile! Notifications - Choose how Spoke keeps you up to date; whether it's via email, Slack, or both! *This will not update the home screen for anyone else’s Spoke, don’t fear!